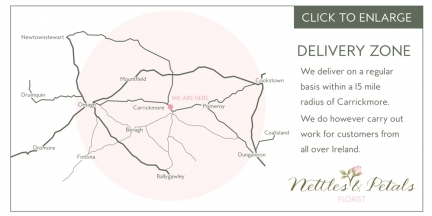 We deliver beautiful bouquets and arrangements within a radius of approximately 15 miles of our shop in Carrickmore. We can design both traditional and contemporary arrangements in a variety of vases, baskets & containers to suit your requirements. Each bouquet is bespoke and designed especially for you. It can make a great gift for a new home, new baby, birthday, anniversary or ‘Just Because;. 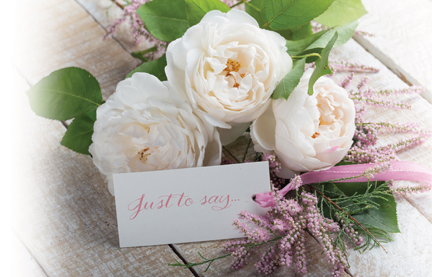 Your fresh flower are selected & arranged in the shop then beautifully gift wrapped and accompanied by your unique card and message. Bouquets and arrangements are prices from £20 + delivery charge. Please call to discuss your requirements so we can help choose what’s right for you.